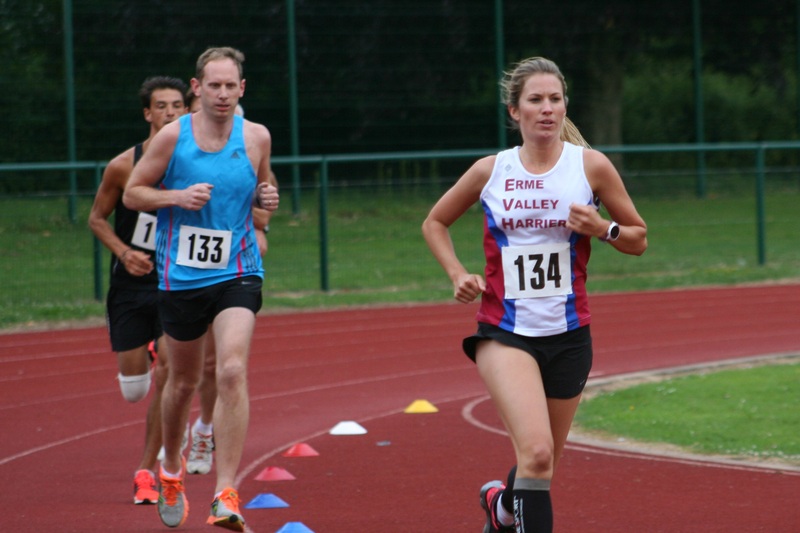 ERME Valley Harriers’ Alison McEwing claimed the Devon women’s 10,000m track title on Wednesday night at Tavistock. On a perfect evening for running, McEwing clocked 37:58.43 for the 25 laps. North Devon’s Sarah Sheppard was second in 39:46.97, with Plymouth Harriers’ Jane Allison third, and first veteran home, in 41:14.40. The men’s race was dominated by Bideford AAC, who had the first three runners home. Shaun Ansell won in 30:40.62, Mark Jenkin was second in 31:30.70 and Aaron Richmond took third in 32:08.30. However, there was a good run by 17-year-old Exeter Harrier Jake Liam Smith, who was making his debut at the distance. He came fourth and first under-20 in 32:32.47. Tavistock’s Neil Barkell came fifth in 33:49.38. Tags: Alison McEwing, athletics, Devon, Jane Allison. Bookmark the permalink.